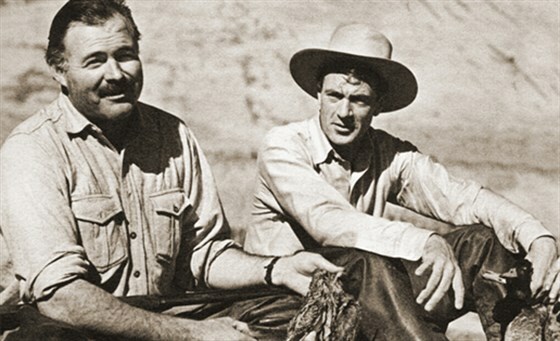 In many ways it was the perfect match: Ernest Hemingway whose heroes personified his definition of courage — "grace under pressure" — and Gary Cooper, the man who often portrayed those characters on screen. Yet in other ways — politically, intellectually, and personally — Hemingway and Cooper were a study in contradictions. The story of this extraordinary 20+ year friendship is the focus of this documentary. The film, narrated by Sam Waterson, features interviews with such Hollywood luminaries as Kirk Douglas, Charlton Heston, George Plimpton, and Patricia Neal. Ernest Hemingway is the most famous American writer of the 20th Century. If you made up a character like Ernest Hemingway, how many would believe it? The mercurial Hemingway left people enchanted, hostile, endeared, confused, charmed, bruised, bitter. To everyone, he was an extraordinary, unforgettable presence. In over 89 movies, Gary Cooper portrayed pioneer, pilot, cowboy and soldier with charm and a succinct stateliness. Gary Cooper was the tall, Western American hero of 20th century film. In a 35-year movie career, he became one of Hollywood's leading men, commanding the screen and public appeal for decades. Special appearance by Mariel Hemingway.